Happy Fourth of July (or Tour de France Day)! I hope you all are enjoying the day with friends, family and food! If being patriotic means cooking up a storm and eating and drinking with friends, then I am oh-so-patriotic. I’ve spent the better part of the past 24 hours shopping, prepping, cooking, and baking all sorts of goodies from British Spicy Mustard to Beer Baked Beans to Bourbon Peach Pies. 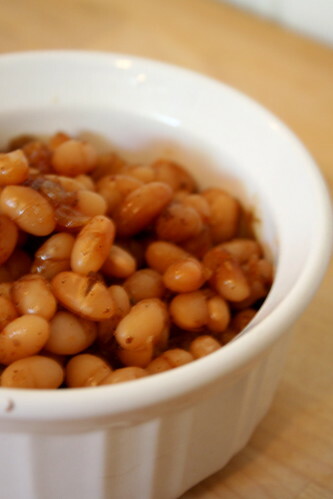 But right now I’m off to enjoy the fruits of my labor and to watch the Prologue of the the Tour de France with friends, so I’ll leave you with this simple and simply delicious recipe for Beer Baked Beans. In a large pot on the stove, bring all ingredients to a boil over medium high heat. Immediately transfer the boiling bean mixture to a large casserole dish, cover with aluminum foil (or the dish’s glass lid) and bake for 1 hour, stirring occasionally. Remove the cover and bake for another hour and a half or until the liquid is mostly absorbed and the top is browned and crusty. Two of my favorite things together at last! Cheers and thanks for the awesome recipe!! I’ve actually never had baked beans… But this has got to be one of the most enticing recipes I’ve seen for them yet! I had my first beer braised beans not too long ago and thought they were really good. Your recipe looks yummy, esp. with all the maple syrup! Dude I know. I seriously don’t buy clothes, shoes or jewelry, so I can justify the expense of gourmet produce. They were well worth it. I’ve been using them as much as I can for the past 3 days. I had to laugh when I first saw “Artisinal” on the package, thinking it was just a fancy word used to make the tofu seem special. Then I tasted it and realized how truly hand-crafted it was. Beer baked beans! Nothing says summer like beer baked beans. I feel so nostalgic when I think of all those great summer bbq’s! Thanks for the bean recipe. My last foray didn’t go so well but I’m ready to jump back on the wagon and this recipe sounds great. Yay for beer-baked beans! The chipotle chili powder sounds like a great addition. Oh my gosh! I must have these as soon as possible! Does the beer add anything, really? I mean, can you taste it? Would you, if you didn’t drink the stuff, want to try this dish? Beer, chipotles, and mustard? Yes, please! wow! homemade baked beans!! for some reason I thought these would be so much more complicated… looks so good… I want I want!! !